The American Jewelry From New Mexico exhibit at the Albuquerque Museum goes well beyond turquoise and silver. 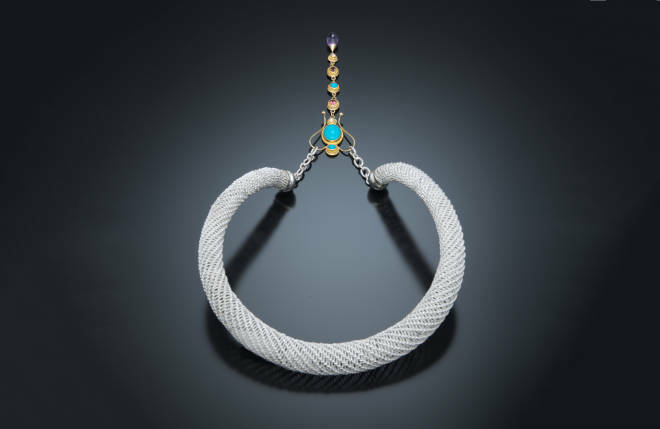 Above: Ousmane Macina’s woven-silver choker with gold and gems. Photograph Courtesy Albuquerque Museum. FROM SPANISH AND MEXICAN SILVERSMITHS to Navajo and Zuni jewelry makers, New Mexico has gained a reputation for finely wrought baubles. But the blending of cultures and their traditions didn’t stop there. By tracking the evolution from the 1870s to the 21st century, visitors to the Albuquerque Museum exhibit, American Jewelry from New Mexico, opening June 2, can essentially trace the history of the state. “There is so much jewelry being created here that’s never been shown as New Mexico jewelry,” says curator Andrew Connors. Consider an AD 400 yucca-fiber necklace with turquoise and abalone embellishments. The presence of Pacific Ocean shells speaks to an early and vast trade network—as well as the human impulse to love what’s shiny and new. Spanish silverwork wasn’t part of Native traditions, but it was quickly adopted and raised to new levels of excellence. In the 20th century, Anglo artists invested pieces with Art Deco flair, hippie trimmings, and laser-cut techniques. Many of the contemporary artists in the exhibit enjoy international fame, while going incognito at home. Connors attributes that to a soon-to-be-outdated notion of “New Mexico jewelry” consisting of silver and turquoise and not much else. Between the museum’s collections and loans from private collectors and other institutions, nearly 400 pieces will dazzle visitors—while imparting gems of artistic cross-pollination. Standouts range from a golden pendant of a two-headed Aztec serpent by Santa Fe’s Ramón José López, a renowned santero, to an aquamarine-and-diamond pendant by Nancy Attaway, one of the most sought-after stonecutters in the world, who just happens to live in Albuquerque’s East Mountains. Ousmane Macina, a Malian immigrant to Santa Fe, uses low-tech processes to turn silver and gold mined by his family into intricately woven and filigree designs. Greek immigrant Stavros Eleftheriou started Matí by Kabana some 30 years ago in Albuquerque and now shares his gold-work techniques with Native jewelers. Do not skip the museum store, he adds. “They’re going to go all out.” American Jewelry from New Mexico runs through October 14 (2000 Mountain Road NW, 505-243-7255, nmmag.us/abq museum).